below are just the written step-by-step instructions. If you don't know what is on your movie reels just send them in, and we will convert them in the order they were received. If you already know what is on your movie reels, number each reel letting us know the order they belong in. Fill out our online Order Form, if you need help at any time, don't hesitate to call us at 1-800-776-8357. Place all your items in a shipping box with packing material so that your movie reels are not jumbled around in the box. 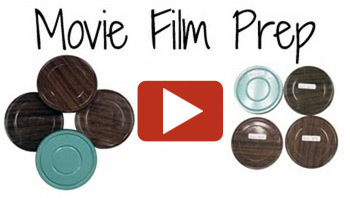 Make sure you include your order form in your box so we know who the movie reels belong to when they arrive. We do not recommend using the Post Office to ship your movie film. Step 5: We Take Care of the Rest!